Killer Characters: Who Knew Fly Fishing Could Be Lethal?! Who Knew Fly Fishing Could Be Lethal?! As a whitewater river ranger, I’ve been in more than my fair share of sketchy situations, where I wasn’t sure I was going to make it out of the rapids alive, or if the person I was trying to rescue was going to make it out alive. But, it sure surprised me to learn in Wicked Eddies how dangerous fly fishing can be! Most of the fly fishers (men and women) I know are gentle souls because their time on the river bleeds the anger and angst out of them. But then I discovered the body of fisherman Howie Abbott in an Arkansas River campground! After calling for help, I wondered who in the world would want to kill a fisherman—with such rage? Then I found out about the upcoming fly fishing tournament. People can turn anything, even the peaceful past-time of fly fishing into a competition. And, if you get people competing, then some of them can get riled up, especially if they find out someone was cheating—like Howie was. Another surprise was how my best bud, Cynthia Abbott, a bartender at “The Vic,” reacted to the news—as if she didn’t care that her uncle was dead. She was more worried about her missing niece who had run away from home. I’ll definitely be on the lookout for 15-year-old Faith. Between working extra shifts to patrol the tournament beats and being on the investigative team for Howie Abbott’s case, I’ve got some overtime coming up. I’d much rather kick back with a Fat Tire beer in my hand on my lumpy old sofa, my dog Lucky on one side and my boyfriend Rob on the other. Though, Rob’s been getting serious lately, and I’m not sure I’m ready for that! Who do you think might kill a fly fisherman? And don’t say his wife! Howie was single. Next guess? And has anyone tried whitewater rafting? On what rivers? While you’re thinking of answers, check out the website of the author of Wicked Eddies, Beth Groundwater. 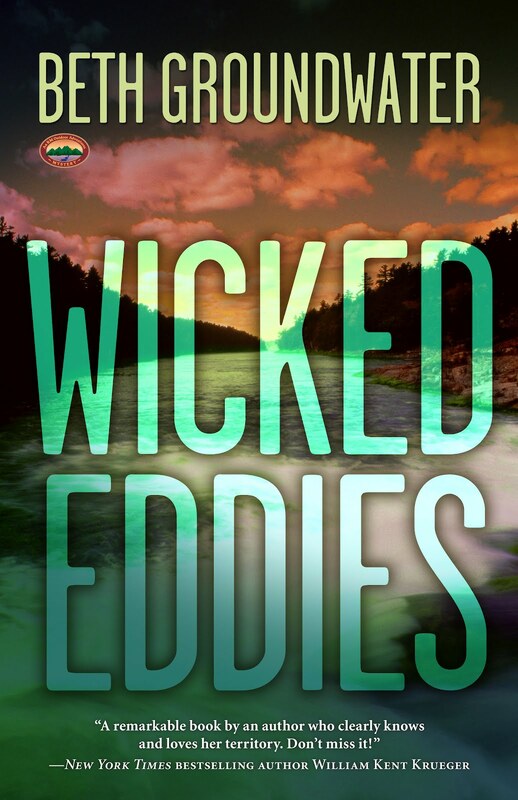 Wicked eddies in those rivers--maybe you should keep your eyes open for someone named Ed. Yes, Janet, I've gotten some jokes about the killer being named Ed! ;-) For those who don't know, an eddy is a small whirlpool that forms downstream of a stationary object (such as a large rock) in a whitewater river. It's caused by the water rushing back into the "empty space" in the downflow stream created by the obstacle. Was he swatted? Did someone fly off the handle at him? You're lucky you didn't have to fish him out of the water! I guess even gentle souls can have murderous tendencies sometimes. Beth let me borrow her login to reply, since I'm more river-saavy than computer-saavy. Yes, Joyce, especially when those gentle souls are defending a loved one, stressed out to the max, or so angry they could spit bees. As for me, I'm stressed out by the lowest snow pack levels in Colorado in a long time. Doesn't bode well for this spring's whitewater season. Sounds like a great next entry in the series, Beth! I can think of all sorts of gruesome ways...but I think I'd rather read yours. Will be looking forward to the book's release. Pretty intriguing plot.